It’s been nearly two years since I attended the RopenSci UnConf 2017 in LA and worked with Gergely Daróczi, Brooke Anderson, David Smith, Mario Inchiosa, and Adi Zaidi to create the miner package for interacting with Minecraft from R. We spent a half-day writing the package and then a day and a half playing, with a bunch of our ideas implemented in the craft package and illustrated in the bookdown book, R programming with Minecraft. My next goal was to make a ggplot2::theme_gray()-styled scatterplot within Minecraft. Like, I wasn’t so ambitious that I wanted to add a geom_minecraft() or a ggplot2 Minecraft plugin, but I thought it’d be cool to make an image of a ggplot2-style graph in Minecraft and then pretend that I’d done it properly. 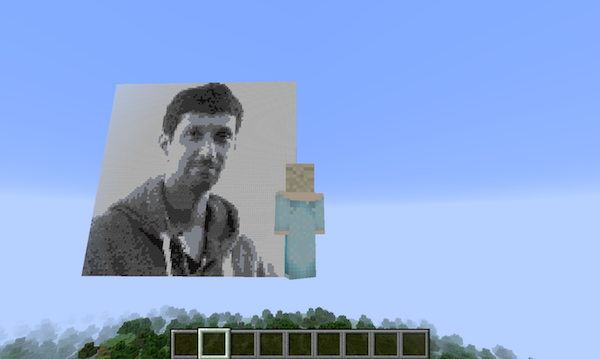 If I can create an image in Minecraft, then of course I can create a scatterplot. The only tricky part would be the axis labels: being able to write text in Minecraft. Yeah so that’s great. I could see these images of the fonts, with the available characters, but what I wanted was like a bitmap: for example, for each character in a 6x8 font, I wanted 0s and 1s indicating which bits need to be dark versus light. Ugh, I spent a couple of hours googling and puzzling over this. Why would they provide these images and not provide a bitmap, so that you could actually make the font? I mean, the title of that page was “Font Bitmaps”! Finally I realized that, just like the picture of Karthik that I had made, the PNG images I was looking at were the bitmaps. I could load them into R with the imager package and then grab the 0s and 1s there. The only thing I needed to do was look at the images and type in the sets of characters that were inside the images. For example, for the 6x8 image above, the PNG file is 192 x 24 pixels: 24 pixels tall because there are three rows of characters and they each are 8 characters tall, and 192 pixels wide because there are 32 columns of characters and they are each 6 pixels wide. The script I used to set up the fonts is hiding inside the craft package. 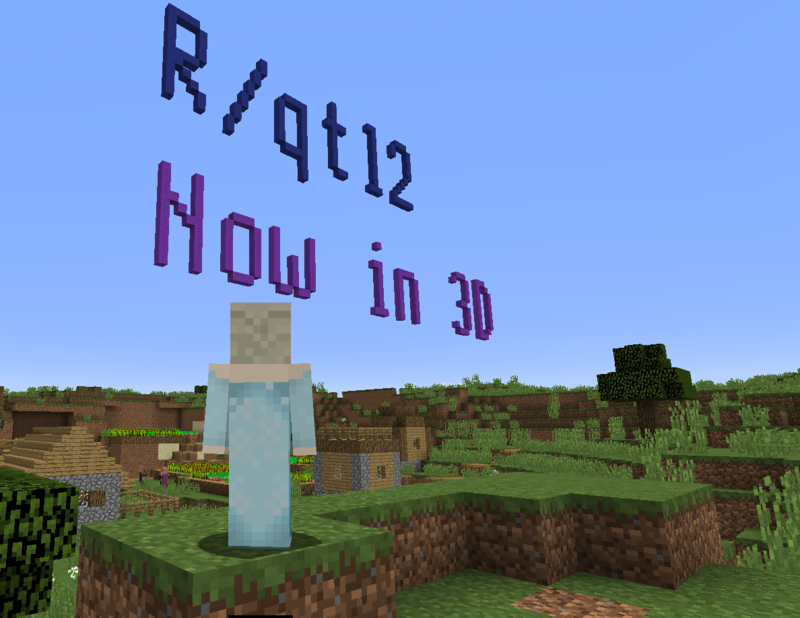 For text I want to write in Minecraft, I first split it into the individual characters. Then I convert each character into a bitmap. For each size font, we basically have a matrix of available characters and then a matrix that is the font image bitmap. I find the character in the font, and then pull out the corresponding chunk of the font bitmap. I then paste those bitmaps back together, to get a bitmap for the full text. Finally, I render it in Minecraft by looping over the elements of the bitmap matrix of 0s and 1s and adding a block wherever there’s a 1, using miner::setBlock(). The other tricky bit was figuring out which direction to draw the text. And like, how many different directions can you draw text in 3d space? Really, I have a terrible spatial sense. And I refuse to admit how long it took me to work through that.